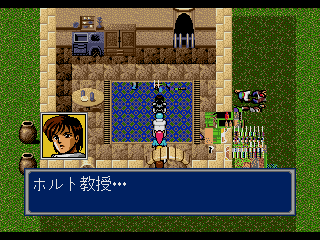 Phantasy Star IV is the fourth and final installment of the futuristic Phantasy Star RPG classic series. It's considerably more story-heavy than its predecessors with an intriguing plot, memorable characters, and an interesting battle system, that included the ability to set up action macros and thus help expedite one of the more tedious aspects of any RPG. 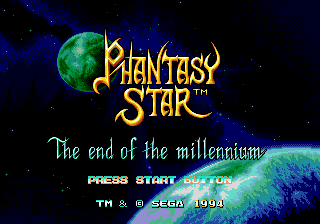 Later titles featuring the Phantasy Star name would branch off into completely different continuities. 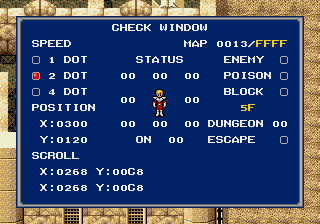 The game's debug menu can be accessed with one of two codes, depending upon the system the game is playing on. For games that need the Game Genie code, use FFEC9F:06, and for PAR use the code FFEC9E:06. While these codes are active, they set the cursor position for the party and system menus - rendering them effectively unusable until the codes are deactivated. They also interfere with Yes/No options and the space travel menu. To access debugging functions, press the Start button when outside of battle, then Confirm. The screen displayed in the screenshot above should open. It can be closed at any time by pressing Start. Speed: The three options here can be selected using Up and Down on the D-Pad. They set the player's base movement speed, and take effect immediately. The default is 2. 1 is slower, and is used when characters need to walk slowly as part of events. 4 is the fastest speed, and is used to make certain NPC sprites run faster than the player can follow. In Zosa, which requires the player maintain the default speed as part of a penguin walk, the game reverts to the 2 option, if this is changed. Enemy, Poison, Block: These are toggled on and off by the A, B, and C buttons respectively. The Enemy option toggles enemy encounters either on or off. In a few select areas, this value is locked and cannot be changed. Toggling encounters on in an area where the game doesn't have formation data causes the game to crash when an encounter is triggered. Poison simply toggles on or off whether poisoned characters take damage while walking around. Block turns tile collision on or off, allowing the player to walk through anything but other sprites. It also disables event checking so events triggered by walking on a tile or interacting with a tile will not be triggered. For example, opening the chest with the Eclipse Torch in it normally triggers a fight with one Specter but with the Block option enabled that fight will not occur until the Block option is toggled back off. All of the following values are display-only and cannot be manipulated via the debug menu. Position and Scroll: These six values display the player's current X/Y position and scroll information in hexadecimal. Map: These two hex values reference two map regions: the first value is the current area and the second is area the player last exited. Under certain conditions the second value will read FFFF. Status and On: During debugging, this would have been used to ensure collision and tile properties were set correctly. These nine numbers tell the viewer what type of tiles are adjacent to the player, as well as what tile they are standing on at the moment. By default, ordinary passable tiles are 00 and impassable tiles are 08. Dungeon: This value is a reference number for the dungeon the player currently occupies. If it is not zero, the game cannot be saved. Escape: When this is toggled on, the Hinas spell and Escapipes transport the player to the current dungeon's entrance. This is used in places like Kuran, where teleporting outside is technically impossible with the way the game is structured. The sound test itself is a well-known bonus feature. It unlocks if the game detects a clear file during bootup, and is accessed by pressing the B button from the Continue screen. Pressing Start while in the sound test reboots the game. A transition effect was removed or disabled when the game was ported for North American release. An example of this transition can be found below. Curiously, some graphics were removed as well. The title, 一曲即発 (ikkyoku sokuhatsu) is a difficult to translate pun on 一触即発 (isshouku sokuhatsu), which means "[an] explosive situation", or more literally "explodes with one touch". 一曲即発 would roughly mean "explodes with one melody". There are 4 unused items in the game which are identical across versions. Nicknamed the 'Blood Axe' by fans, this nameless, description-less item can only be equipped by Gryz. It is a two-handed axe with 36 attack power, 10 defense power, and has a listed Meseta value of 380. It also has a unique attack animation. This item was likely cut because Gryz has plenty of weapons for the early part of the game, and this one didn't offer anything substantial. As can be seen from this screenshot, the animation had bright red droplet-like sprites which are obviously unfinished. This might have been considered too gory for an otherwise bloodless RPG, and work was halted in the early stages of animation. This nameless item has a description of ???? in the Japanese version, and would be equippable by anyone but Seth - except the item type is set to 09, a value used to mark plot-necessary items that cannot be equipped, discarded or sold. It offers 20 defense and 10 magic defense. Because it was not intended to be sold, it has no Meseta value. The so-called 'Spiral Slasher' is a one-handed slasher that can be equipped by Alys and Kyra. Enemies hit with it may be put to sleep if they fail a strength check. This weapon offers 38 attack power, has a meseta value of 200, and an unfinished unique attack animation. This weapon has two problems. The first is that the sparkly animation that is supposed to trail the spinning slasher is instead displayed above it. The second problem is that this particular animation uses the background palette, rather than the weapon palette. This item was likely cut to how it can potentially put all enemies to sleep at once, which may have been a feature the developers thought was too overpowered, and to compensate, the Moon Slasher was added as a replacement, which is slightly stronger than the Spiral Slasher, and can potentially put all enemies to sleep when used as an item. This short YouTube video shows (with some additional explanation) animations for the Blood Axe and Spiral Slasher along with how the original Japanese sound test looks and sounds in action. The fourth and final item is a map that, when used, brings up a representation of either Motavia or Dezolis. Both maps can be scrolled horizontally, and Motavia's vertically, using the D-Pad. When either are initially opened, they are tiled in such a way that the world's wrapping point is the center of the map. For example, this places Skure, the huge pit that marks the outer boundaries on Dezolis, in the center. This default orientation can make finding landmarks difficult and may have contributed to the decision to dummy out the feature. 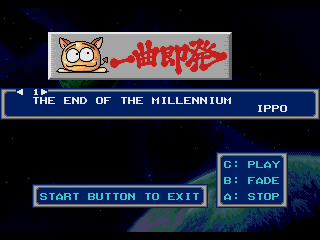 When the game was translated into English, the planet names were left with their original Japanese table values and thus appear as 'cavespeak' - English letters mixed with Japanese. The labels translate as Motavia and Dezolis, respectively. 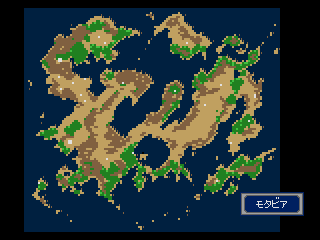 Dezolis's map is still in a rough state with noise, as the game fills in the defined boundaries with data around the map image itself. Noise areas are valid coordinates in game but clearly not intended for player use as they are impassable mountains with bugged enemy encounters. This map cannot scroll vertically. It lacks one site marker (excluding the hidden Space Port) which is the Esper Mansion. 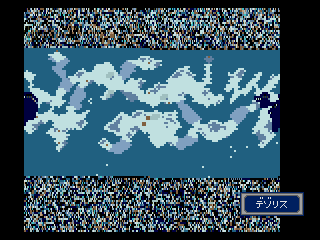 The towns of Meese and Reshel along with the Musk Cat cave are small brown squares that are difficult to see in the map's default dimensions. The Garuberk Tower is also not marked, although the tower's location is presented as a minor mystery in the narrative, and putting it on the map would have spoiled the surprise. While Gryz can only equip two-handed axes in the final release, graphics and programming from a presumed earlier development state exist of him as being able to equip knives. As they are not used for any corresponding weapons, it seems the developers may have recycled them for his "Sweeping" Skill (a clone of Chaz's "Airslash") which he possesses at the end of the game. Sweeping uses only the right hand configuration (because all two-handed weapons are treated as being held in the right hand) but the coding for Gryz's attack animations for the left hand or a weapon in both hands are complete and fully functional. The game will flip the right hand frames for a left hand attack, something which it will not due for Raja or Rune who also use all two-handed weapons. Graphics for a rooster and a different dog -- not that fat dog, Rocky -- that don't appear anywhere in the game proper. The Principal of Motavia Academy, Dezolisian high priests, and blonde-haired Espers have walk cycles, but they're always stuck in place in the final game. Zio has animations for walking west, east, and north, but he only ever walks south. Gyuna has a full-body sprite, complete with waistcoat, but only the top of his body is ever seen. 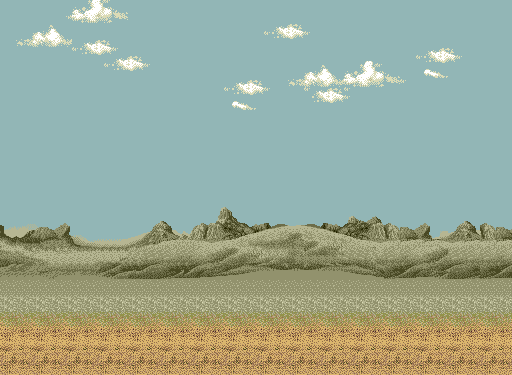 Even disabling the foreground and background layers won't reveal more of the sprite - seems they realized the lower half would never be seen, so they didn't bother filling in the tilemap. This large background can be seen in-game but not completely, due to scale, scrolling, foreground obstructions, and programmer error. It is used as the background layer for the two times the player must walk between towers in Zio's Fort, and the background for the top levels of the Fort and Ladea Tower to create an illusion of height. 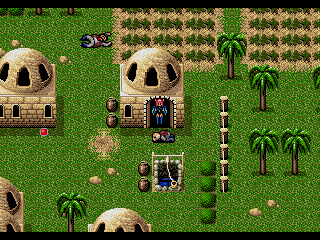 The background's width is best suited for Ladea Tower, but when the tile map was programmed for that screen, errors were made that resulted in some tiles being omitted completely. When the game was being localized for the North American audience, two enemies were disabled from appearing as part of enemy formations. They still exist in the English version, and their names were translated, but all formations containing them were removed from the final retail release. They can still be encountered in early localization prototypes. On the left is the Akasha (translated as Acacia in the English version). This spirit appears in groups of one to four when Chaz is alone in the sword cavern. The only thing they can do is physically attack, although if Wren were still in the party, their electrical touch attacks would be quite deadly for the android. On the right is The Edge's darker palette swap, who has a unique ability as seen below. They also appear in groups of one to four and are common enemies early in The Edge. The Star Dust spell assails the player's party with pillars of bright white energy. 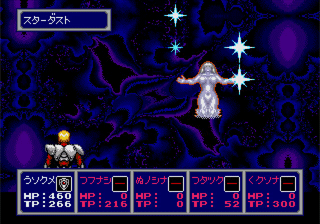 While the Shadow Mirage is controversial enough by design, Star Dust causes the screen to flash, and may have just added to the localization team's decision to disable this encounter. There are several bits of dialogue and system text that went unseen. Some of it is simply an error of design, others were left unused because the system didn't need them. In all final versions of the game, it is impossible to examine the statue of Alis and read the attached description because doing so as part of the events that put Chaz there triggers a cutscene. After the cutscene, the party is returned to the Esper Mansion and the door to the sword cavern is sealed again. It is thus only possible using a method to walk through walls. Below is what this line says in the English version. It is normally impossible to leave Piata before defeating the Igglanova in the university basement. 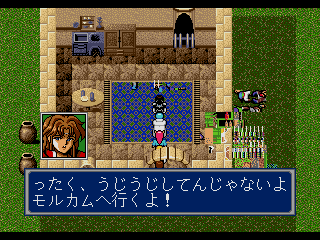 By using a walk through walls code to leave Piata at the very beginning of the game, the party will return to Piata with the guards saying the following lines. Guards: For crying out loud, I'm telling you, you can't go outside!" Upon return in the English version, the townspeople will respond with blank text boxes. In the Japanese version, this does not occur. Shopkeepers present a particular case. Most of them have text, despite being unreachable behind their counters - yet of these, the majority repeat a line from someone else in the same town. A few have blank text, and the remaining handful don't even have a trigger associated with their sprite. The following two lines are exceptions to all of the above. Reshel innkeeper: "At last we can breathe easy. We're going to rebuild Reshel back to its original splendor! No, even better than that! Jut innkeeper: Oh my, a Parmanian guest, how rare. So is it that interesting to you to go see a Dezolisian temple? Chaz then says: I wonder if this person wants any business? It's a kan ja. By the way, sick people are also kanja! Rika: Raja, how do you know such a thing? Raja: It's a feeling I have! 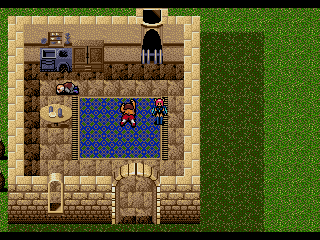 In earlier Phantasy Star games, it was possible to end up with a ghost party by carefully manipulating events. However, the developers of Phantasy Star 4 averted this by having the game check each step to find out if the party is dead, or near death, and display a corresponding message. This is necessary, because poison was changed from its earlier incarnation of preventing healing, to dealing damage over time while on the overworld. 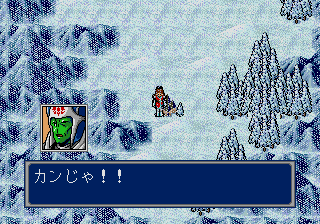 When the game was translated into English, the "party is all dead" line ended up partially illegible, due to a programming error. The line does not have a terminator programmed into it, and so the game keeps printing what it finds, until it gets to one obscuring part of the message with text meant for the menu. Chaz and his Companions have perished. Listed among the place names is the entry GHOULFORST, short for Ghoul Forest, between Meese and Esper Mansion. The only forest in the game is the carnivorous one blocking access to Garuberk Tower. The forest tiles contain no teleport to an unused region, and the whole forest is destroyed when the player approaches with the Eclipse Torch in their inventory. Even when hacking in an item that can kill the plants instantly, the forest remains intact and unchanged until the event flag with the Eclipse Torch is set. An extra story screen was added for the North American release showing Chaz holding the Torch up for this event. This, combined with the presence of undead in Reshel nearby and within the tower itself, suggests the Eclipse Torch was only originally planned to destroy the carnivorous plants protecting the forest's border, and the player would then have to navigate it to reach the tower. At the end of the game, all of the inhabitants of Mile are slain. Upon entering the town, Chaz and his group find the citizens dead, and the buildings either locked, or blocked, as in the case of the item shop and one house. Normally, it is not possible to enter either building, but with the debug menu, doing so is a simple task. The item shop is exactly how it has always been and is fully functional. The barred buildings no longer have any teleports to the interior maps associated with them, but one building that is still open and obstructed by the body of a fallen old man can be entered, so long as the player can walk through walls. Within is the old man from outside, and the body of a woman. Everything else about the house is as it was, and the player can examine their fireplace and cupboards. Trying to talk to either corpse brings up a line fragment, and writes graphical garbage over the screen. It is corrected by leaving, but the game will lag significantly until then. 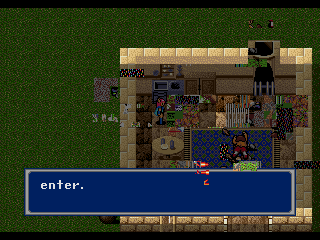 In the Japanese version of the game, the tool shop works as before, and the old man's house is blocked. Going inside produces the above conversation, and the screen glitches, although not as severely. The dialogue called originates from a considerably earlier point in the game. Lyla: That does it! There's no time to waste! To Molcom! Chaz can learn up to 15 different techniques by leveling up, with the last technique being Nazan. However, he can also learn an additional technique, Megid, independent of leveling up. 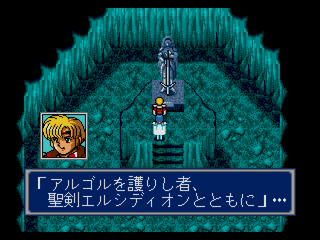 In the original Japanese version, the game tries to put Megid in his 15th technique slot; If Chaz has already learned Nazan, it will be permanently overwritten by Megid. This was fixed in international releases (And in all Virtual Console versions) by placing it in his 16th technique slot instead. The Virtual Console version of the game includes a plaintext ASM patch - complete with developer comments in Japanese - that is applied to the game in real-time. The patch changes the "flashing colours" effects to lower the chances of epileptic fits, and fixes a bug related to Level 99. There's also commented out code for "experience for debug after the battle". This page was last modified on 28 March 2019, at 03:05.